The 28-year-old Nunes, of Brazil, barely broke a sweat against a helpless Rousey to easily retain her UFC women’s bantamweight belt on Friday night in Las Vegas. Referee Herb Dean stopped the rout at 48 seconds of the opening round after Nunes landed an overhand right, followed by a straight left to Rousey’s head. “She had her time. She did a lot for this sport. Thank you, Ronda Rousey. I’m the champion, the Lion,” Nunes said. 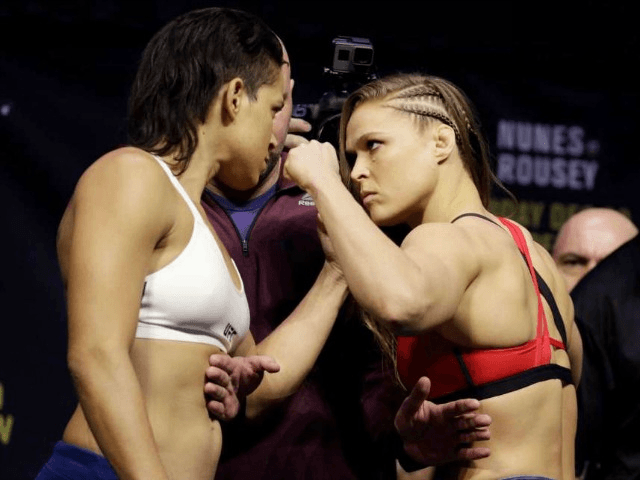 Rousey entered the octagon first with her trademark scowl, but the angry demeanour quickly turned to desperation as the former champion looked out of her class from the moment Nunes backed her up with the first overhand right. The 29-year-old from Los Angeles had not fought in over a year since she was pummelled in similar fashion by Holly Holm. Following that loss, Rousey went into seclusion and kept a low profile in the build-up to the Nunes fight by declining to do interviews. The Holm loss also shattered the mystique that Rousey had developed during the 12 straight wins that kickstarted her career. She is now 12-2 overall. Rousey, a former Olympic judo medalist, is one of MMA’s biggest stars and has helped widen the sport’s global appeal. So it was no surprise that her return after a protracted absence created a huge buzz, with organizers predicting record pay per view buys. Rousey earned a guaranteed $3 million payday for less than a minute’s work. Nunes collected $100,000. Perhaps the most surprising aspect for US fans on Friday was Rousey’s inability to put up any semblance of a defence. She was rocked by a number of overhand rights before finally being wobbled one last time and appeared to be out on her feet. Rousey managed to stay up by holding onto the side of the cage with her right hand. After it was over, Rousey did not stick around. She exited the cage quickly without doing any interviews, leaving many to wonder if she will ever return to her old form.